The Tusk Rubber cap keeps funnels clean and from dripping oil/chemicals on your workbench or shop floor. 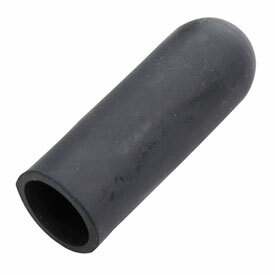 Made from chemical resistant rubber, these caps will hold up to oil and other chemicals used on your motorcycle, ATV, or UTV. Fits the "Motion Pro Pro Funnel" and any other funnel with ends ranging from 3/8" up to 1/2". Universal fit for funnel ends from 3/8" to 1/2"
Difficult to remove, maybe a different rubber would work better. When buying the Motion Pro Funnel you need to buy this cap. It saves you from making a mess after a oil change. Can't beat that price either because something that cheap will save a lot of headaches. Works like a charm! This rubber cap will plug the spout on the Motion Pro oil funnel to keep it from dripping after an oil change. Good to have to keep your funnel clean. Especially using it with oils and lube that attract dirt! If you don't like drips, this is the product to go with your Pro Motion Funnel.